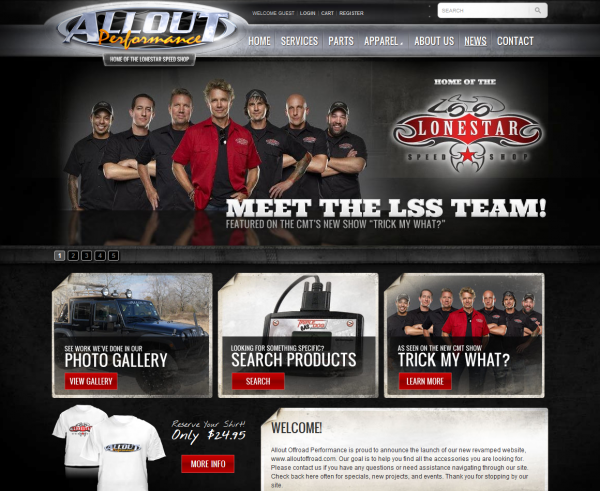 All Out Off Road realized that a powerful online presence had the capability to not only increase exposure of their TV show “Trick My What?”, but foot traffic at their automotive parts & accessories retail location Lonestar Speed Shop. Powered by Catalog Rack from DCi, an eStore Local website offered All Out Off Road the opportunity to provide potential customers with a complete online catalog, while maintaining an aesthetically pleasing website design that reflected the culture of their show. By providing a service that dynamically populates product information for thousands of parts from hundreds of the top automotive aftermarket brands, it’s easy to maintain an online presence with eStore Local on their side. After implementing these features created specifically to drive success in the automotive aftermarket industry, All Out Off Road was on their way to gaining exposure and driving foot traffic to their automotive parts shop.